While my New Jersey cousins were probably eating cucuzza in July and August, it took us in the West until October to get a cucuzza harvest. As I have mentioned in previous posts we had a cold, wet spring and the seeds did not thrive. We tried again as it warmed up and the snails ate them. But the third time was a success. We put cucuzza seeds on opposite sides of the yard and both sections thrived. For those who may not know cucuzza, it looks like a long, light green baseball bat. I thought it was in the zucchini family, but it is actually in the gourd/marrow family. When I looked it up I got an article on calabash. Its taste and texture remind me more of the loofah stir fries in Chinese restaurants than zucchini. It is mild and sweet with no bitterness. It does have a few cucumber overtones. My late Uncle Frank grew amazing cucuzza. He gave me some seeds last summer and, when I see the ripe cucuzza on my counter, I think of him and smile. I love macaroni and cucuzza. Until this year we had been unable to grow it or buy it, so it was a treat when my Aunt Fran made it for us last summer and my daughter couldn’t get enough of it. She ate hers and her brother’s portion. I got instructions from Aunt Fran on how to freeze it so we could enjoy cucuzza all year long. Peel, remove seeds, cut into cubes and freeze in 2-3 cup packages with a little fresh basil added. I now have a dozen bags for the winter. When ready to use, run the bag under cold water to loosen cucuzza cubes and it begins to defrost. Add to whatever you are making. 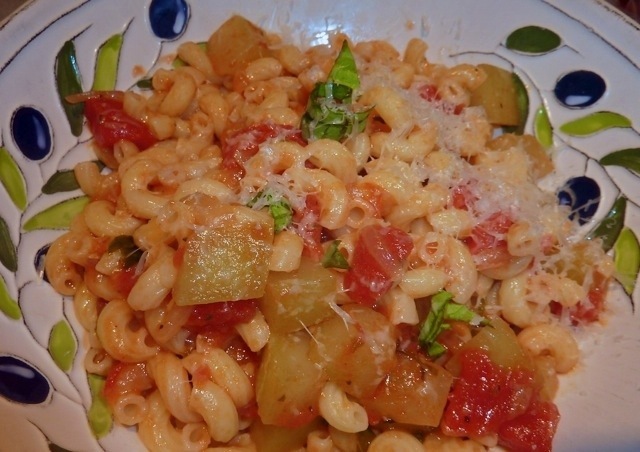 My cousins agreed that grating a bit of aged ricotta salata over macaroni and cucuzza was the best cheese for such a dish. It was the cheese my grandfather used. I didn’t have a locally available source for that cheese, so I just used parmesan. Some people like the dish on the drier side, but I like it with a bit more liquid. Add a ladleful or two of pasta water to the sauce if you prefer it more soupy. Enjoy! In a frying pan heat olive oil then add onion and saute 5 minutes until soft and golden. Add garlic and saute until soft, about 1 minute. Add tomatoes, water, sugar, salt, pepper and cucuzza. Stir, then add 4 chopped basil leaves and oregano. Cover and bring to the boil. Reduce heat and simmer for 20 minutes or until cucuzza cubes are tender when pierced with a fork. Do not let it get mushy. Cook pasta while sauce is cooking. Pour cucuzza sauce over cooked macaroni. Top with grated cheese and garnish with remaining basil. Serves 5. Note: A variation on the recipe that we enjoy is to brown 1/2 lb. loose sweet Italian sausage and add it to the sauce along with 2 cups chicken stock and use 2 cups diced tomatoes. This entry was posted in Pasta, Vegetables. Bookmark the permalink.